For children under 10, sneakers are normally suitable for baseball. 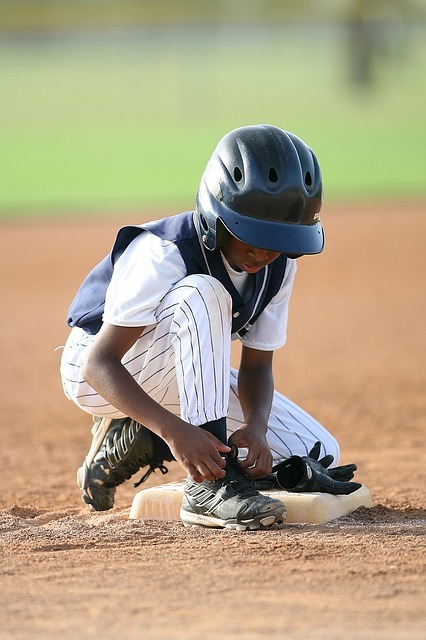 While cleats are generally not dangerous, children should break them in before bringing them to a game. While cleats may enhance play, they can expose your ankle to twists and turns. Children with pre-existing foot conditions should see a podiatric physician before putting on cleats. Avoid hand-me-downs or bad-fitting cleats because they may increase the danger of ankle injuries. When sizing cleats, make sure the feet are measured properly, and always wear a game-size sock when trying them on. In some competitive baseball leagues, the use of metal spikes is permitted. Spikes can be dangerous weapons on the base paths and require a certain level of maturity to be worn safely. They are not necessary for casual play, and should not be worn unless in league competition. Spikes, which technology has made lighter and more flexible these days, perform the same function as cleats, but grab the ground differently. They too should be worn on a limited basis until the feel of how they engage the turf is understood. Unfamiliarity with spikes can lead to ankle twists and turns in a competitive situation. When wearing cleats or spikes for the first time, watch for irritation, blisters, or redness, which could indicate a problem in the legs or feet. Pain is a clear indicator of a problem. If cleats cause pain, discontinue wear for two to three days; if it returns, contact our office for an evaluation.